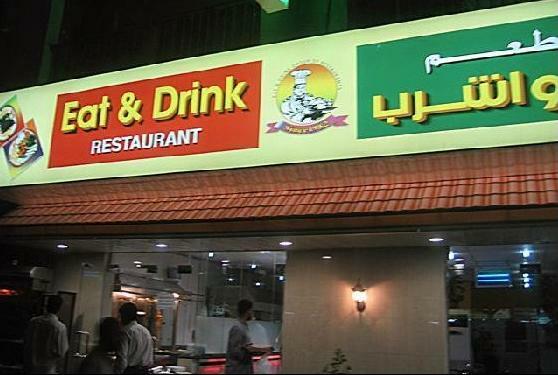 Eat & Drink Restaurant group has a wide network of branches in Dubai and one of their outlet can also be located next to the Choithram Supermarket in Al Garhoud, Dubai. Like all other branches, this Eat & Drink Restaurant also serves authentic Indian fare, which includes supreme vegetable dishes as well. The main aim of this restaurant is to provide scrumptious and quality food at cheap rates therefore, the settings are kept very simple and food is dished up in traditional steel style dishes. Lot of working class people are regular customers of this Indian restaurant, as this site provides freshly prepared food with typical scent of Indian spices to these folks at affordable price. To gallop this delicious food down Eat & Drink Restaurant also offers regular drinks with the food. Although, Eat & Drink Restaurant is an unpretentious eating place, but it’s Indian and vegetarian food is absolutely lip smacking and not less than a real treat for Indian food lovers. Guests get to savour these delicious dishes in a simple, but neat and clean environment. The price of the food at this eatery is also very cheap therefore it attracts lot of people each day. Some of these hungry fellows also avail the take away service of this restaurant, if they do not have enough time to dine-in. In brief, this bistro is a great value for money and their staff provides a friendly service. Guests can enjoy breakfast, lunch and dinner at this eatery on daily basis from 8:00 am till 2:00 am. Next to Choithram Supermarket, Street # 31A, Al Garhoud, Dubai, United Arab Emirates. 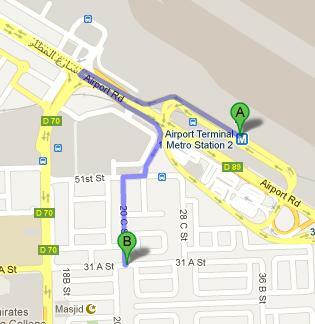 Airport Terminal 1 Metro Station 1 is 1.9 kilometres walking journey from the Eat & Drink Restaurant. Metro users can bridge this gap in about 24 minutes, if they head northwest towards D 70 from this metro station and then Turn left onto D 70 from where they should turn left toward 51st Street in order to make a slight right turn towards 51st Street. After that commuters should turn right onto 51st Street before making a left turn onto 20 C Street that will lead them to the final turn on the left side that goes to 31 A Street and bring them in front of destination soon. Dubai Civil Aviation College 2 – Dubai bus stop is 400 meters walk from the Eat & Drink Restaurant and one can cover this distance in 5 minutes approximately. If that person follows these directions: Head north on D 70 towards 31 A Street and turn right onto 31 A Street. Guests of Eat & Drink Restaurant can use bus number 32C to reach this bus stop. See the map for directions.